NEW DELHI: The Narendra Modi government's programme to get consumers to replace less efficient CFL or incandescent lights with latest LED bulbs is gaining momentum, with the number of bulbs distributed crossing the 2-crore mark and generating annual savings of over Rs 1,000 crore. Data available with the government showed that more than 2 crore subsidized LED bulbs had been distributed under the Domestic Efficient Lighting Programme till Thursday evening, helping in daily energy savings of 73 lakh units, which translates into Rs 2.9 crore a day. With the programme gaining momentum, lighting giant Philips and other companies have shown interest in setting up manufacturing facility in the country given that the scale is suddenly looking much bigger than what they had originally anticipated. The government is looking to provide 77 crore bulbs by 2018. "Since the order was small, parts of components are being imported. But now everyone is saying we want to manufacture in India," power minister Piyush Goyal told TOI. He said an earlier skepticism is giving way to genuine interest in the Indian market. The DELP was launched by Modi on January 5. The scheme also fits well with the Modi government's strategy for climate talks since it is helping reduce the carbon footprint as well as reducing peak power demand by close to 700 MW through lower energy consumption. Although some of the states had been slow off the block, they are now gaining pace. Among the states, Andhra Pradesh is currently way ahead of the pack with 65 lakh bulbs, followed by Delhi at a little under 34 lakh and Uttar Pradesh at 33 lakh. Guntur in Andhra appeared to be the top performing district in the country, with 18.6 lakh LED bulbs. Goyal said hard bargain has seen bulb prices come down from Rs 310 for a 7W bulb to Rs 73 for a 9W bulb last month with "no compromise on technical aspects, or on the qualification criteria". 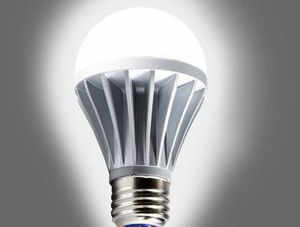 The government is now looking to place an order for 10 crore bulbs, the minister said.